What Day Of The Week Is November 10? 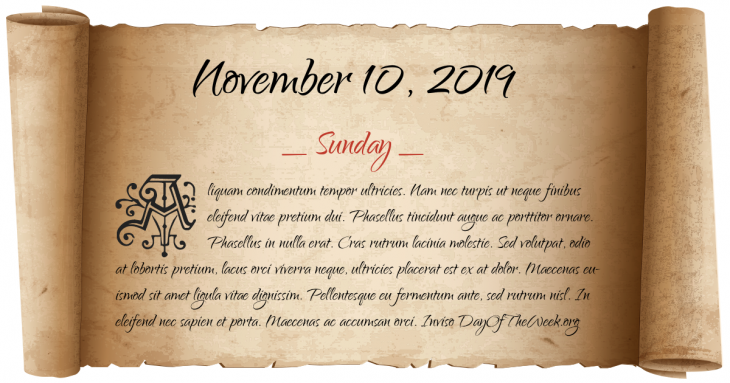 November 10, 2019 is the 314th day of the year 2019 in the Gregorian calendar. There are 51 days remaining until the end of the year. The day of the week is Sunday. René Descartes has the dreams that inspire his Meditations on First Philosophy. The passenger ship Stephen Whitney is wrecked in thick fog off the southern coast of Ireland, killing 92 of the 110 on board. The disaster results in the construction of the Fastnet Rock lighthouse. Beginning of the Wilmington Insurrection of 1898, the only instance of a municipal government being overthrown in US history. The Western Union Cable Office in North Sydney, Nova Scotia receives a top-secret coded message from Europe (that would be sent to Ottawa, Ontario and Washington, DC) that said on November 11, 1918 all fighting would cease on land, sea and in the air. The first national convention of the American Legion is held in Minneapolis, Minnesota, ending on November 12. World War II: Germany invades Vichy France following French Admiral François Darlan’s agreement to an armistice with the Allies in North Africa. National Educational Television (the predecessor to the Public Broadcasting Service) in the United States debuts the children’s television program Sesame Street. The 729-foot-long freighter SS Edmund Fitzgerald sinks during a storm on Lake Superior, killing all 29 crew on board. WorldCom and MCI Communications announce a $37 billion merger (the largest merger in US history at the time). Who were born on November 10?